For weeks, I have been lamenting the end of The Great British Baking Show. And now here I am, on the other end of the finale. The very deserving Nancy has been crowned champion, even though my sister and I were rooting for Luis. (The teenaged Martha was my favorite all along—so much potential!) I have been so emotionally invested in this reality competition television program that I cried. To put this in perspective, I did not cry during the series finale of Parks and Recreation earlier in the week. Don’t get me wrong: Leslie and co. received the heartwarming send-off we all wanted. The difference is that I wanted Parks to end, whereas I have no idea what I am going to without The Great British Baking Show. Nancy, the Best British Amateur Baker, from The Great British Baking Show. Photo courtesy of PBS. I am not a baker; I don’t really know my way around the kitchen. My domain is restricted to the sink, where I do the washing up while the cook puts his/her feet up after dinner. But I do love bread, cakes, cookies, pastries, donuts, etc. Whenever a judge, whether Paul Hollywood or Mary Berry, gave an amateur baking contestant negative feedback, I liked to say, with a bit of a shrug, “I’d eat it.” When the design of a cake or the flavor of a tart didn’t come off quite as intended: “I’d still eat it.” Every week, I was in awe of the twelve contestants’ talent—well, if I’m being completely honest, it was more like the top six bakers. They were the ones who impressed the most with their skill and creativity. Richard, Five-Time Star Baker, from The Great British Baking Show. Photo courtesy of PBS. In fact, when you think about it, that’s what this baking competition has been about: balancing skill and creativity in equal proportions. 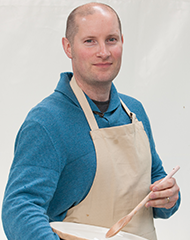 Richard, a builder from London, won the coveted title Star Baker an unprecedented five times throughout the season, mainly because his precision and balance of flavors hit the mark. On the other hand, Luis’s background in graphic design gave our beloved Mancunian an advantage when it came to crafting stunning personal artworks made of food. Sometimes the bakes were bang on; sometimes they were overdone. 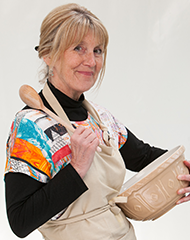 A retired office manager for a general medical practice, Nancy-of-Lincolnshire won because, as she displayed on the final weekend in the tent, she produced more technically accurate bakes with the right amount of visual flair. As much as I wanted Luis to win, I would have accepted anyone. But it does tickle the belly that the sole woman in the top three triumphed over the men. 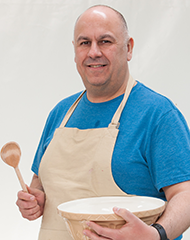 Luis, my favorite to win The Great British Baking Show. Photo courtesy of PBS. What made The Great British Baking Show so watchable, so satisfying, was the representation of friendly competition. No one was a diva, a trouble-maker, or a back-stabber. Everyone, at least from how the makers edited it together, seemed to get along. They were supportive of each other in times of doubt or after receiving stinging critiques. There was a kerfuffle midway through, when it was debatable whether or not Diana purposefully forgot to put Iain’s baked Alaska back in the freezer. But it was Iain’s decision to throw away everything that he was working on that cost him a place in the tent the next week. Emotions, I learned, do run high in the kitchen, and if you don’t control them, they can burn you. That’s another thing. As the hosts for the PBS pledge drive accompanying (or is it obstructing?) the finale made clear, over and over and over again, The Great British Baking Show is very educational. I have learned more about baking than I could ever have imagined. For instance, British English favors “sponge” for what we Americans call “cake,” cake as opposed to frosting. I now have a lot of respect for those brave enough to bake, and I recognize that I have no business messing with the oven nobs or toying with the stand mixer. My place is behind the gingham altar. Next time someone brings me something sweet and doughy to eat, I will try not to eat everything on display before me. < Previous Who is Laura Lamont?